GREY’S ANATOMY settled after last week’s big midseason premiere. ABC: GREY’S ANATOMY dropped 0.3 to 1.6. 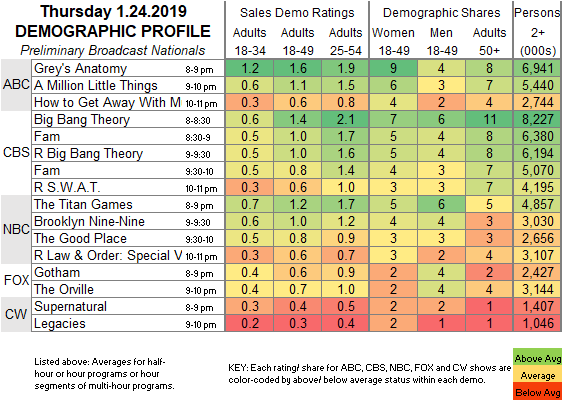 Despite the lower lead-in, A MILLION LITTLE THINGS was steady at 1.1, and HOW TO GET AWAY WITH MURDER lost 0.1 to a series low 0.6. CBS: The network tried interspersing reruns of THE BIG BANG THEORY at 1.4/1.0 with new episodes of FAM at 1.0/0.8, both consistent with last week’s post-MOM 0.9. A SWAT rerun ended the night at 0.6. NBC: THE TITAN GAMES dropped 0.1 to 1.2. BROOKLYN NINE-NINE gained 0.1 to 1.0, and the season finale of THE GOOD PLACE was at 0.8, steady with last week but down 0.3 from the 2018 finale. The night wound up with an SVU rerun at 0.6. FOX: GOTHAM fell 0.1 to 0.6, and THE ORVILLE held at 0.7. CW: SUPERNATURAL was steady with last week’s 0.4, and LEGACIES returned from a break that started on December 13 with a steady 0.3. NBC airs FIGURE SKATING tonight, and BIG BROTHER: CELEBRITY EDITION resumes on CBS. 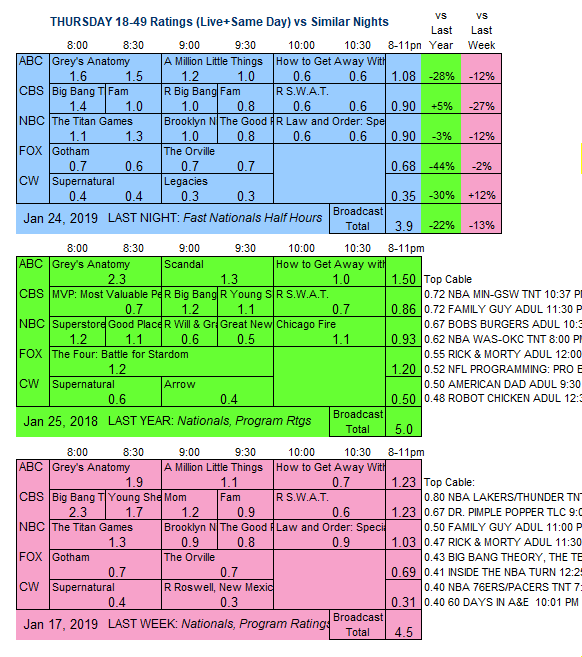 CABLE RATINGS: Come back this afternoon for detailed demographic ratings for top Thursday cable programs. Thursday broadcast final ratings will be available Monday morning, the final delay caused by the MLK holiday.